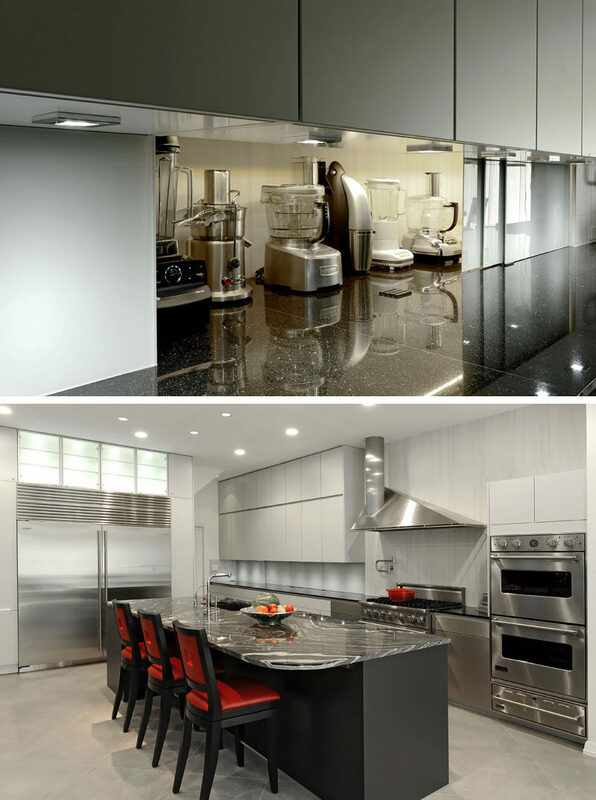 Coffee makers, mixers, toasters, blenders and other large kitchen appliances can be tough to store. 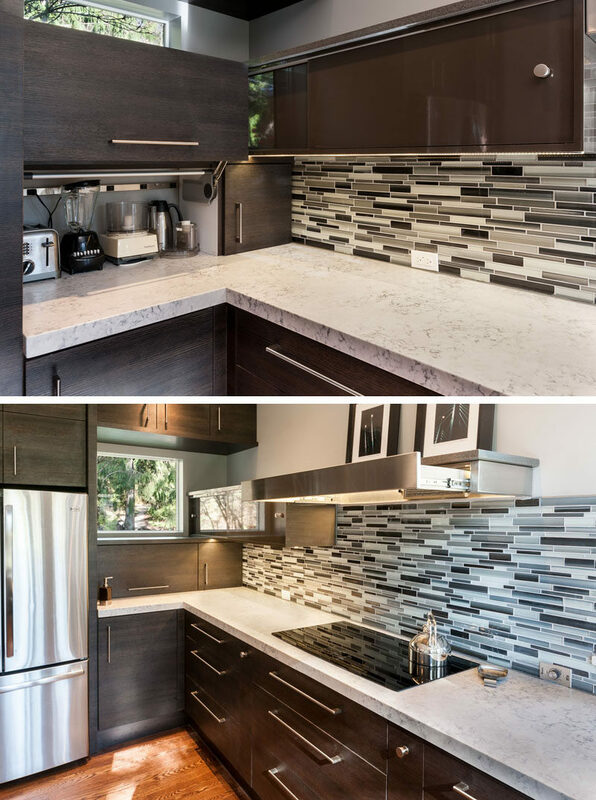 They’re large, bulky, and take up a substantial amount of counter space. 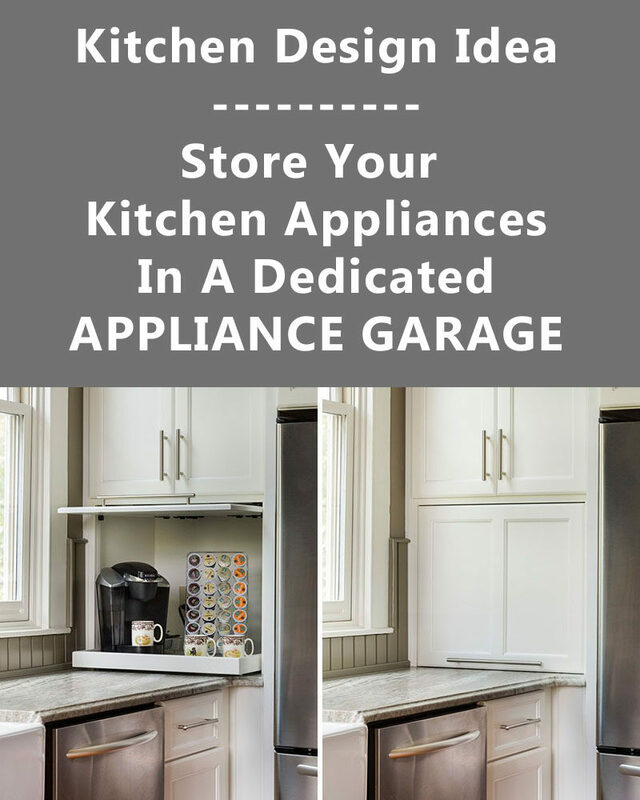 An appliance garage solves that problem and creates a place for them to be conveniently stored when they’re not being used and doesn’t take up any extra counter space. Using rolling doors to conceal the appliance garage is a great idea because it can completely open up when you need it to, but can also be only partially opened to continue hiding the other things stored in there. For example, the sliding door of this large appliance garage hides the appliances as well as various recipe books and coffee mugs. 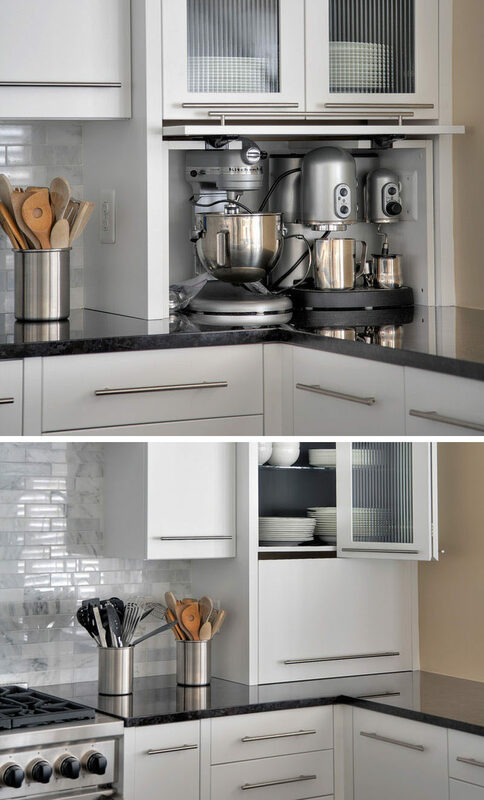 This rolling appliance garage door can be opened just enough to get the coffee maker out in the morning, and can be opened completely to access recipe books and storage containers later on in the day. Designed by ZeroEnergy Design. Photography by Eric Roth Photography. The coffee machine and the accessories that go with it fit perfectly inside this well lit appliance garage with rolling door. 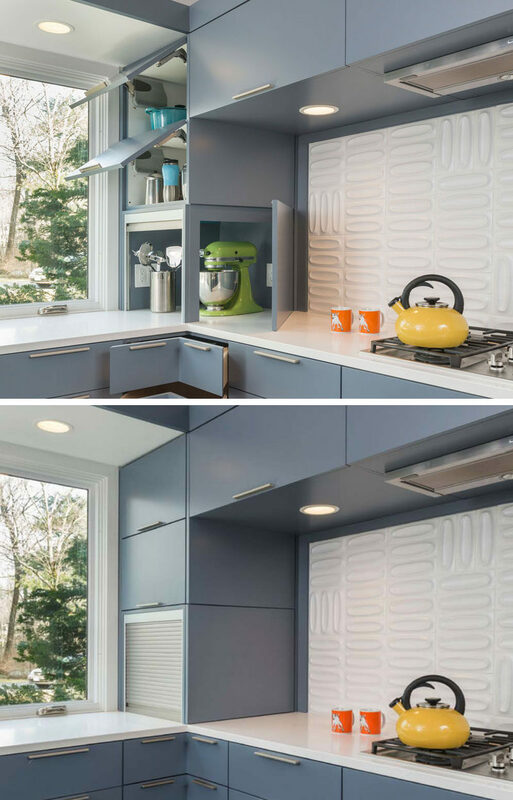 In the kitchen below, the silver garage door slides up to reveal the inside of the appliance storage space, while the blue cupboard door opens on the other side to provide even more access to the appliances when you need to use them. Designed by Flavin Architects. Photography by Nat Rea Photography. 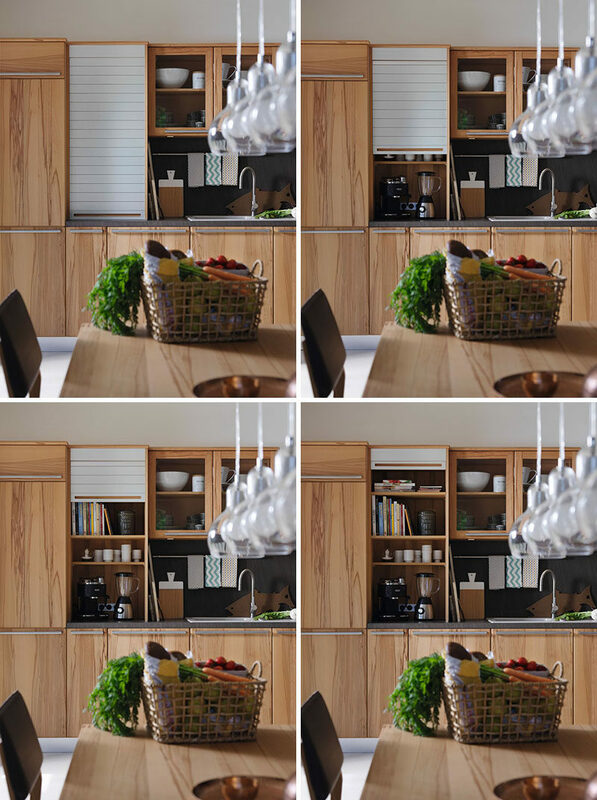 Folding doors open just like the other doors you’d find on a cupboard and help to make the appliance garage blend in even more with the rest of the kitchen. In the kitchen below, folding doors hide the space above the microwave, which is large enough to store multiple appliances and everything you need to make a cup of tea. 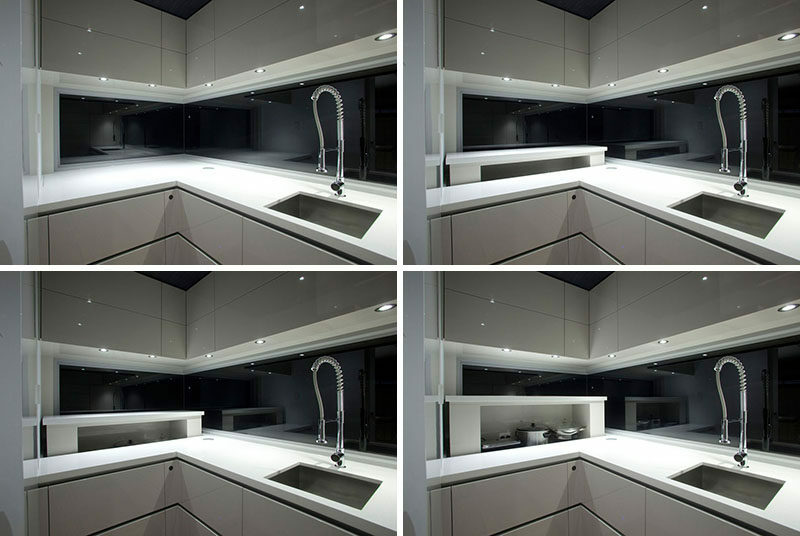 Designed by Alternative Kitchen Company. 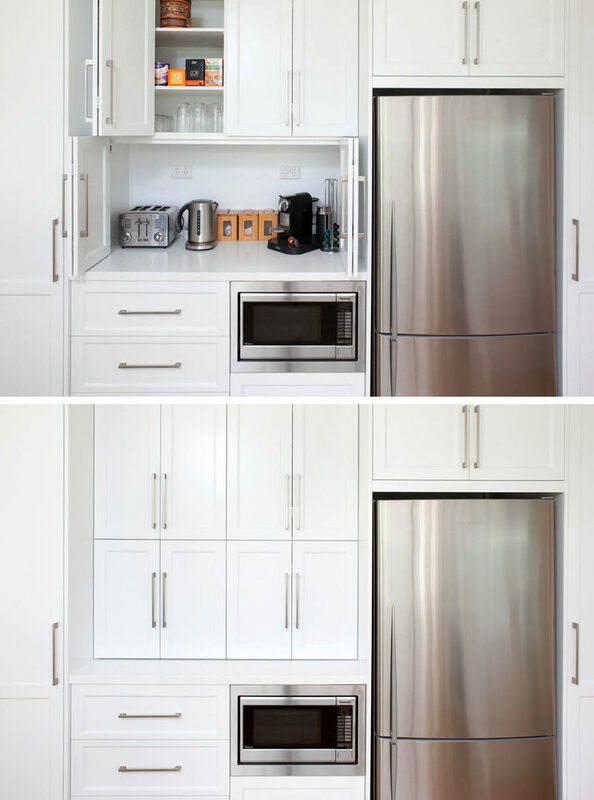 Doors that lift up, rather than out, are a convenient way to hide your appliances because they take up less space but still blend in with the surrounding drawers and cabinets when closed. The hinges on this appliance garage door make opening and closing the garage practically effortless. Designed by KnockKnock. Photography by Olga Soboleva. 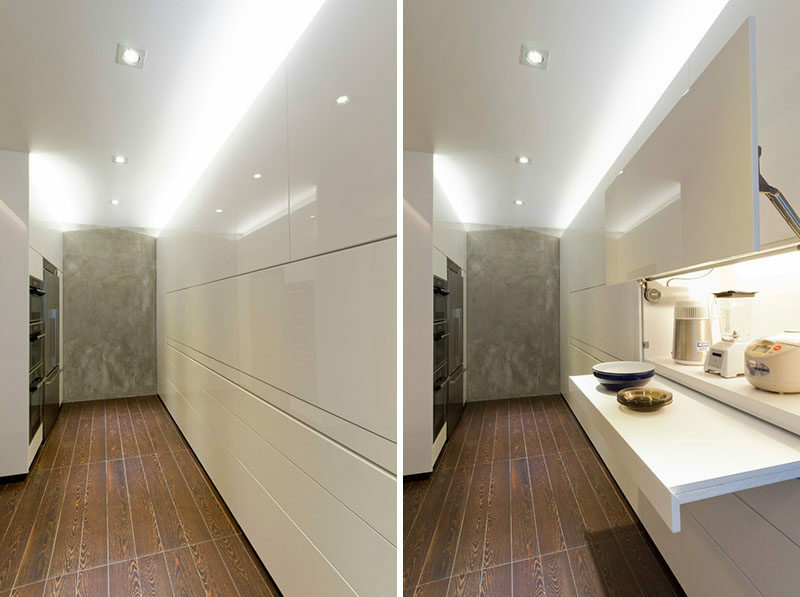 This minimal kitchen conceals everything in glossy white cabinets that lift up to open and reveal the contents inside. The power bar at the back of this appliance garage makes sure there’s ample power for all of the appliances stored inside it. Designed by Richard Landon Design. Sliding doors are a convenient way to hide your appliances and allow you to have full use of the countertop without having to make sure you have enough clearance for doors that swing open and closed. 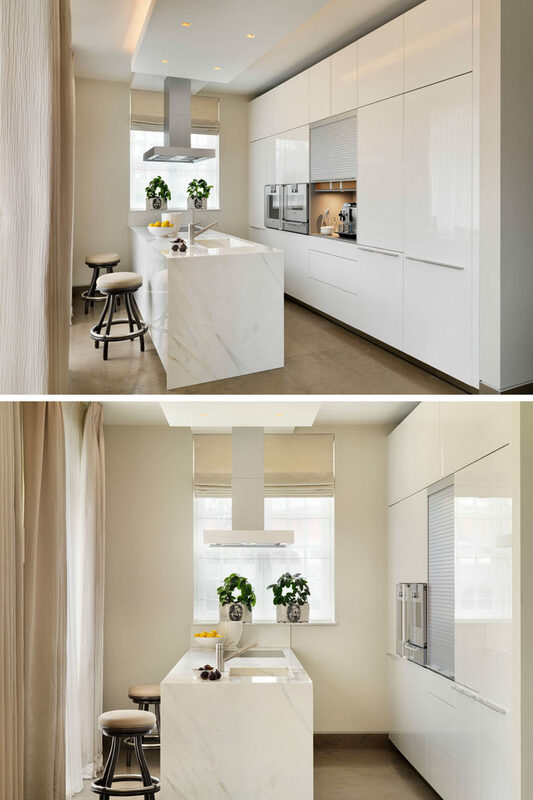 These sliding doors just look like a backsplash when they’re closed but slide open to reveal hidden appliances that are easy to get when you need them. 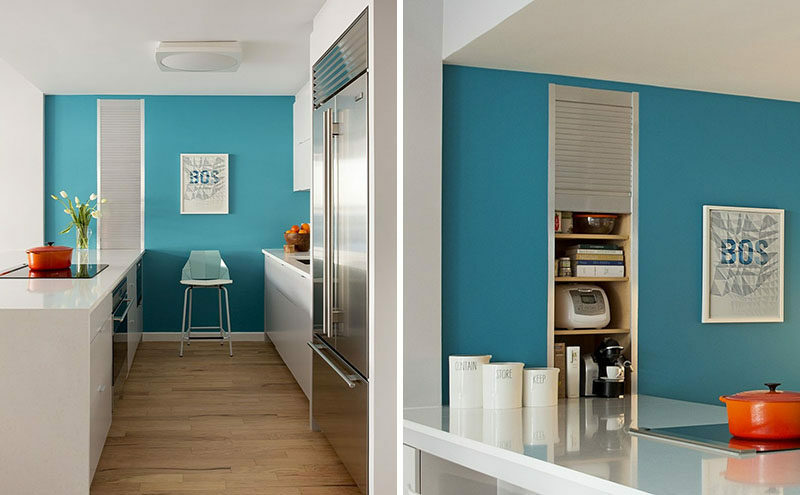 The sliding doors of this appliance garage open to reveal a spacious hiding spot just the right size for the most frequently used appliances. 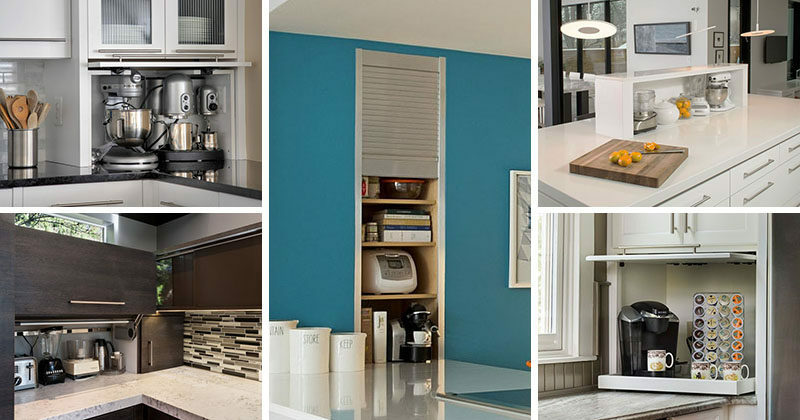 Rising appliance garages are one of the most clever ways to store kitchen appliances. They make it so much easier to access the heavy appliances you’d normally store in the back of a bottom cabinet and they look super sleek. This rising appliance garage features a built-in outlet that allows appliances to be stored and easily have access to power. Designed by Kim Duffin for Sublime Architectural Interiors. 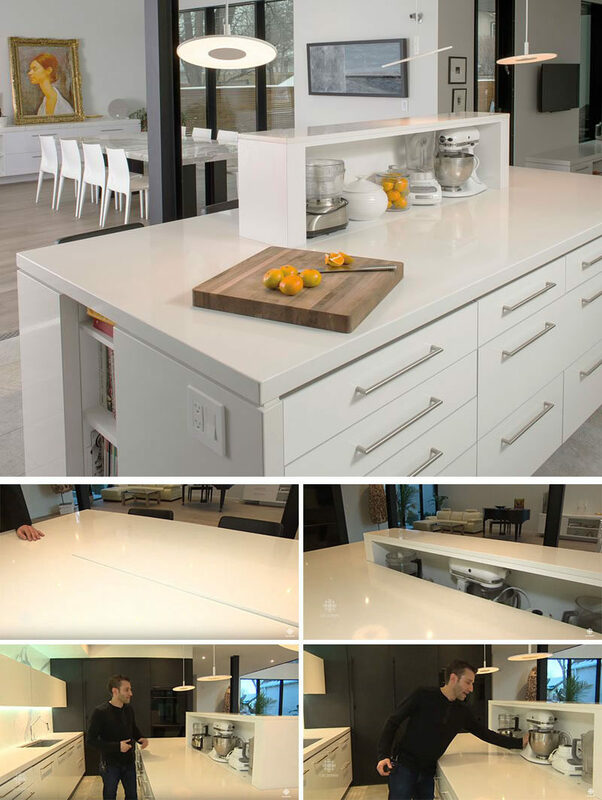 This appliance garage rises up out of the kitchen island when you need it and pops back down when you’re done, giving you full use of the counter tops. See more photos of this kitchen, here. Designed by Secter Design. Photography by David Lipnowski/SubZero Wolf. 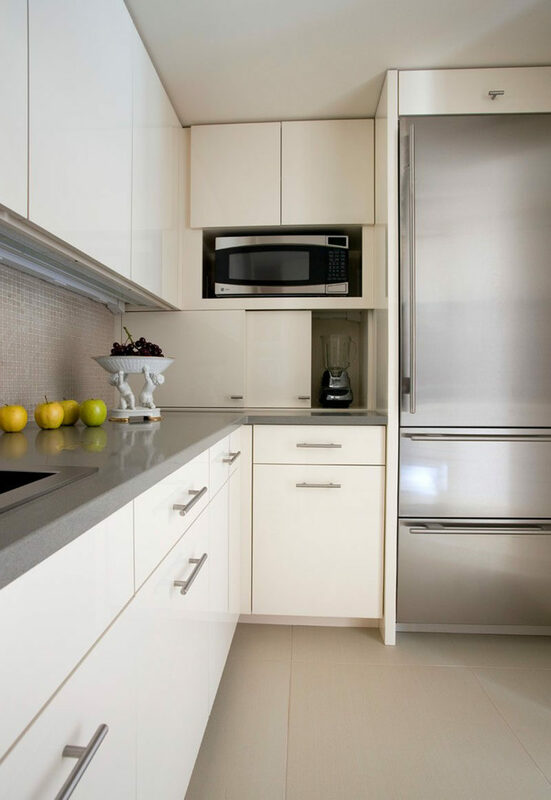 Many appliance garages are concealed by doors that swing open then slide into the sides of the cabinet to keep them out of the way and make the appliances more accessible. 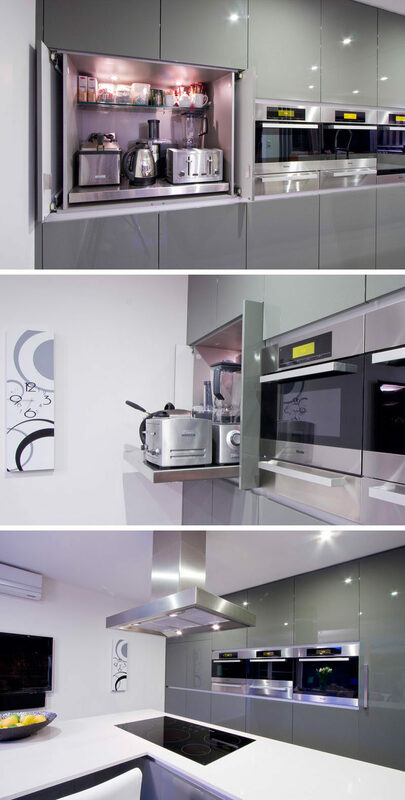 The main shelf of this appliance garage pulls out to make it easier to access the appliances stored at the back. Designed by Darren James Interiors. 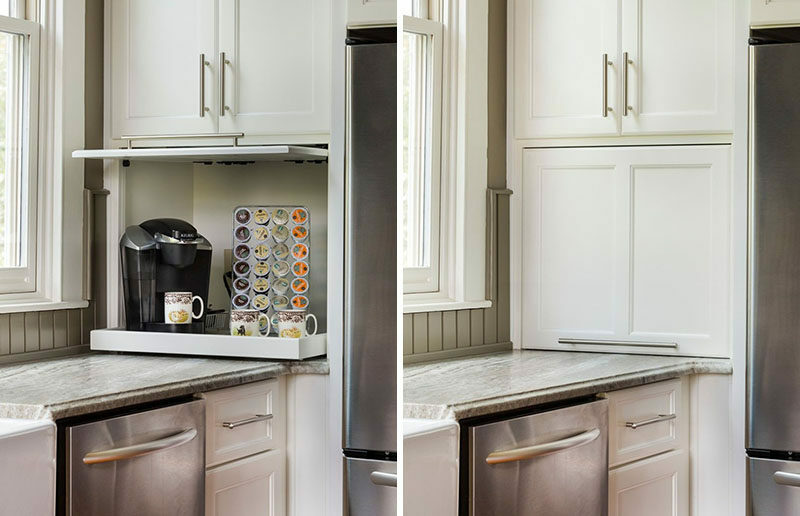 The door of this garage slides open and tucks into the cabinetry to stay out of the way, while the shelf inside pulls out to make the coffee machine easily accessible. Designed by The Aldrich Group, LLC. Photography by Jeff Herr Photography. 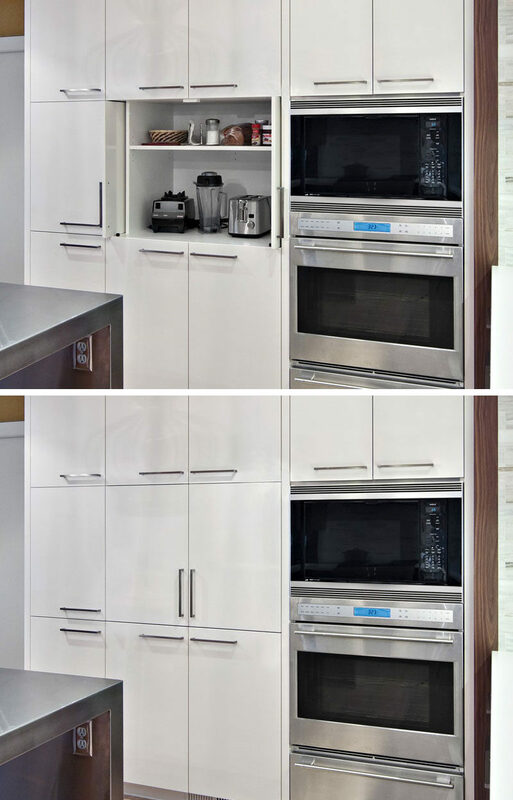 This appliance garage is tall enough to include a second shelf that holds some of the things you’d likely need when using the appliances in the cupboard. Designed by Eminent Interior Design. Photography by Brian Droege. 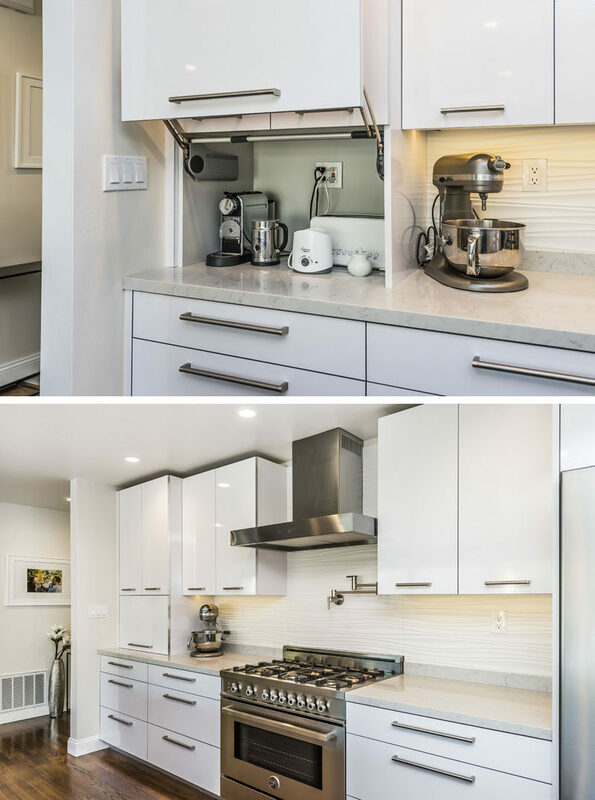 This custom appliance garage perfectly fits the mixer and espresso machine inside it, and keeps them out of the way when they’re not in use. 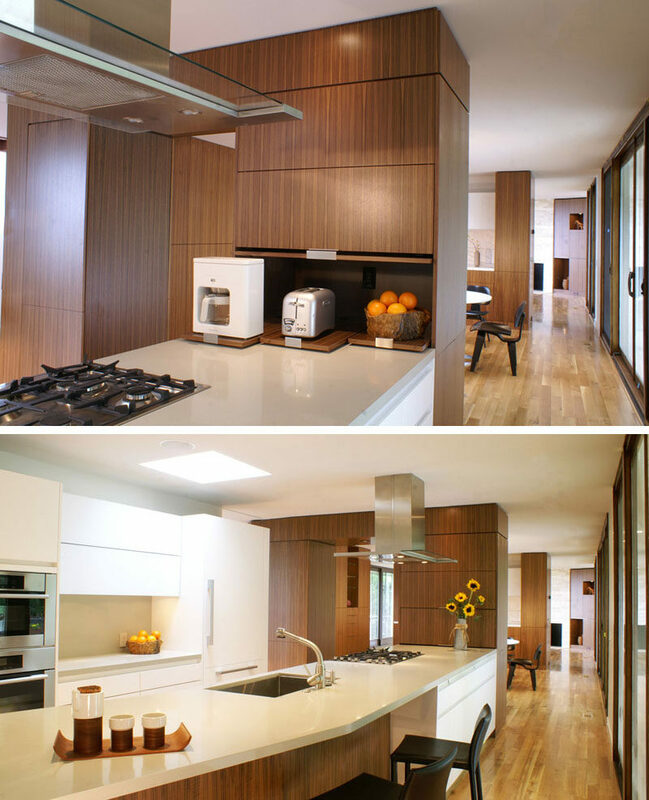 Designed by Jack Rosen Custom Kitchens. Photography by Olson Photographic, LLC. In the kitchen below, the coffee machine and toaster are on pull out shelves that can be pushed into the garage when they’re not in use, and the door comes down to hide everything inside. Designed by Ewald Tajbaksh Architecture.